A gentle introduction to the concept of God and the wonders of creation that is ideally suited to young readers. 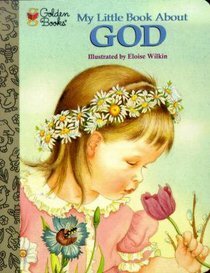 About "My Little Golden Storybook About God"
Jane Werner Watson was the original editor of the first 12 Little Golden Books that launched in 1942. She went on to write scores of Golden Books for the next several decades, including the bestselling "My Little Golden Book About God. "She died in 2004. ýJerry Smath has been a prolific illustrator of Little Golden Books, and other children's books, for decades. He lives in Croton-on-Hudson, New York. Eloise Wilkin (1904-1987) illustrated dozens of classic Golden Books in her long career. Famous for her instantly recognizable style, she provided the art for such books as" Baby Dear, We Help Mommy, and the original Little Golden Book versions of "Prayers for Children and "My Little Golden Book About God.